December 1909 saw Cunard's directors authorising a new liner to operate in union with their famous twin sisters, Mauretania and Lusitania. This was the final stage in fulfilling a long-held Company dream - offering a weekly express service across the Atlantic. Among the details, Cunard specified that the new, larger vessel should 'be constructed of the very best materials, finished complete in a first class style of workmanship to the entire satisfaction of the owners'. In Aquitania, John Brown's Clydebank shipyard more than fulfilled expectations by creating what many have described as the most beautiful four-funnelled liner ever built. Known throughout most of her long and successful career as the 'Ship Beautiful', she was in a class of her own. The combination of superbly balanced external proportions and spectacular interiors, endeared her to all. Sea going manners were equally impressive with her Master on the maiden voyage exclaiming, 'her steadiness and lack of vibration are phenomenal'. During Aquitania's career of almost 36 years with her one owner, she carried a total of 1.2 million passengers over 3 million miles, crossed the Atlantic 442 times and served faithfully throughout two world wars as troop-carrier and hospital ship. The world's last surviving four-funnelled liner's life was further extended as a post-war immigrant ship before finally returning to the Clyde for breaking up in 1950. Dignified and incredibly beautiful to the end, her demise saddened thousands whose lives she had touched across the years. 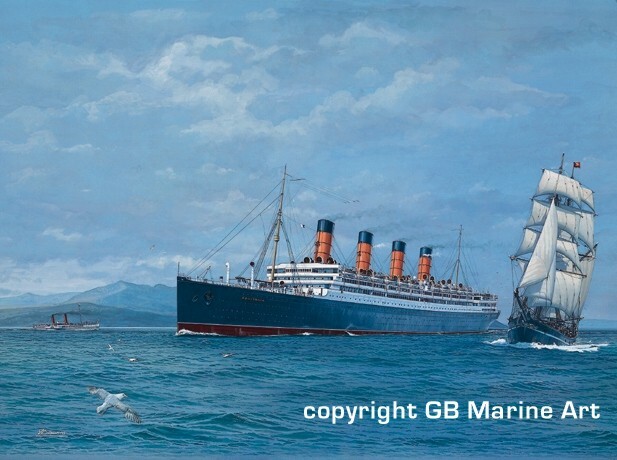 This typically meticulous painting by Gordon Bauwens shows the graceful new liner on builders' trials in May 1914, with PS Glen Sannox and the mountains of Arran in the background. 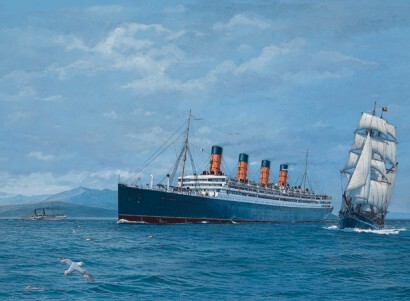 The new Cunarder is seen effortlessly overhauling a south-bound trading brig under full sail, symbolising how inexorably steam was displacing canvas throughout the maritime world. Limited edition of 650 individually signed and numbered fine art prints.